Om 2008.8 is the successor to Om 2007.2 and had ASU as a codename. It will be launched on August 08, 2008. Om 2008.8 uses EFL for the launcher, custom UI applications and Qtopia on X11 for telephony. It is the first step from GTK+ on x11 to using multiple toolkits in combination. 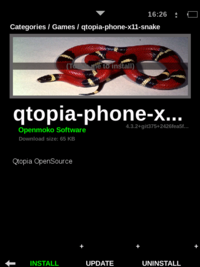 Om 2008.8 now supports EFL, Qtopia and GTK+ applications. To see how it all got started go to Om 2008.8 Feature Plan. Think of our products as galleries. We're building the environment. Each one different from the next. You'll get all the free art supplies you could imagine because we want you to add your own meaning. You choose: consume, create, or both. Om 2008.8 allows you to customize your Neo in many aspects. Use the Installer to find apps and modifications for your Neo. 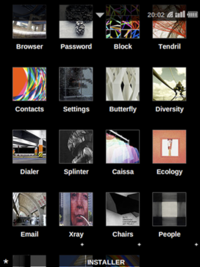 Re-design themes by customizing your own Edje files. Source Codes are publicly available, allowing for customization all the way down to low level sytems. you can use Locations to save your favorite spots and even send it to friends via sms. How cool is that?! share your ideas with the world by adding packages to the Community Repository. 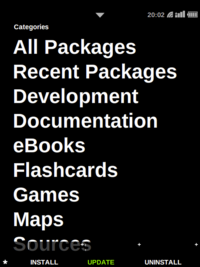 It is a great database for all things openmoko and can easily be accessed by any user through the Installer. For instructions on how to flash your device, please refer to Flashing the Neo FreeRunner.